In a post-apocalyptic world, who can you trust? The question of what any stranger is getting out of the starting a relationship with you and whether or not if these motives are really worthy enough to commit yourself to their company always pop up. Sometimes you might have to give up something small, but there is a good chance that their reasons might be something dangerous and could lead to potential pain and suffering on your part. Therefore, you want to be careful. That is until you meet the legendary Woodman. He has proclaimed to uphold justice and seek to help those in need. Rumors of him have spread throughout the forests of Southern England, and if you meet him, you better hope that you are on the side of good because he is not a person whose bad side you want to be on. This is the hero of G. H. Bright’s first installment of The Woodman series, The Roads of Hell. He will remind you of the concept of Batman in the recent movies featuring this superhero. The Woodman is not a single person, but an idea that can be passed down from one to another in order make sure that justice is served in a violent world. The world of the novel has become a dramatically different place after a man was allowed to get on a plane from Africa with the Ebola virus. The disease quickly spread, and soon many people died. Of course there were those who were able to survive for various reasons, but this was the minority. Without all of those people around to maintain the infrastructure of the world, transportation and communication as now known by modern society became non-existence. Mankind was forced to live in another dark ages where the strong ruled and the weak got preyed upon. This is the world that the Woodman now lives in. He tries to keep safe the little corner that he inhabits as he also protects the only haven that he knows about, Coast Town. The town is under the threat of a vicious criminal, the Black Pope, and his band of knights. They have raided the local museum and used the medieval armor they found there as their new uniforms. They travel the countryside making slaves out of anyone they come across, and threatening everyone with the guns that they carry. It turns into an epic battle to save the innocence of this small town from the obvious threat of evil that is brought there by the Black Pope. The set up to this story creates a very entertaining ride with some wonderful characters. The Black Pope plays out as one of the most memorable villains in recent memory, and the demonic landscape left behind after the epidemic is not your typical post-apocalyptic wasteland. G. H. Bright introduces us to a vivid world of what it would be like if we had to take a step back from out modern conveniences. There are a couple of problems with the overall book. The story continues long after the climax which leave the reader feeling as if things were drug out a little too long. These story lines could have started the second book instead of finishing off the first one. It just seemed to be placed there as a marketing ploy to leave you with a cliffhanger so you would go out and purchase the next installment. I don’t think G. H. Bright needed to do this though. He could have let the story end after the climax, and it would have been entertaining enough that I would have wanted to get the next book anyway. Even with this flaw, it was still a fun read and definitely worth your time. For this reason I give The Woodman: Book One. 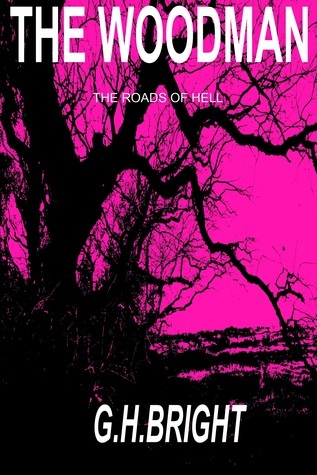 The Roads of Hell a seven out of ten.